Café and restaurant furniture needs to be functional and long lasting. The area available for hospitality furniture will vary greatly and one furniture solution will not suit all cafés and restaurants. This is where Sydney based Emanate Design can help your hospitality business. We have an extensive range of restaurant tables, chairs and bar stools. For space maximisation, we can offer folding tables and stackable café chairs. Beam and bench seating is available for relaxed style dining furniture. Funky ottoman seats can brighten up small areas with their vibrant colours. 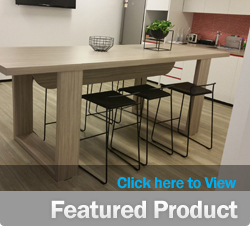 When it comes to quality, our partnership with Interstuhl means we can offer ergonomically designed counter stools that match their chair range. These stools might be particularly attractive for corporate hospitality and breakout rooms. For outdoor catering areas, our UV stabilised café and restaurant furniture will endure in Australia’s harsh climate.